What does the modern marketer want in a publication? A bit of everything. We helped a magazine re-emerge in the omnichannel era. In a crowded banquet room in January 2017, the annual Package Design Matters Conference kicked off with the unveiling of BXP, a media brand devoted to all things brand experience. But the BXP platform isn’t entirely new—it’s the thoughtful evolution of Package Design Magazine, a publication with an established base and serious reach: more than 29,500 readers (namely marketing and C-suite executives) in nearly 250 countries. Above: The transformation from a print publication focused on package design (top left) to a multifaceted platform focused on the full brand experience. The brand partnered with us to assist with brand strategy, naming and visual identity. To make sense of the changing tides and identify a new market fit, the brand brought in Nielsen as a dedicated research partner. In addition, we went one-on-one with shareholders, using interview learnings to draw a blueprint of the new platform and collaborate on content strategy. “To succeed in raising the value of design, we needed to continue to change the conversation with brands, so that we could bring more senior business and C-suite leaders into our community and make them passionate advocates for the role and power of strategic design for businesses and brands,” explains Gerri Brownstein, the brand’s publisher. With a plan for the future, the brand embraced the sea change, dropping its original moniker and repositioning to meet a changed audience’s needs. BXP, short for Brand Experience, arose as a banner for the platform’s new, channel-omniscient lens, built to cover all aspects of the contemporary, digital-era brand. “We wanted to strategically expand the brand to be more relevant,” says Hoskins. “It was a positioning change, as well as an identity change.” The new approach preserves the power of print, but also welcomes the experiential touchpoints more applicable to today’s user, including POP, digital and mobile. 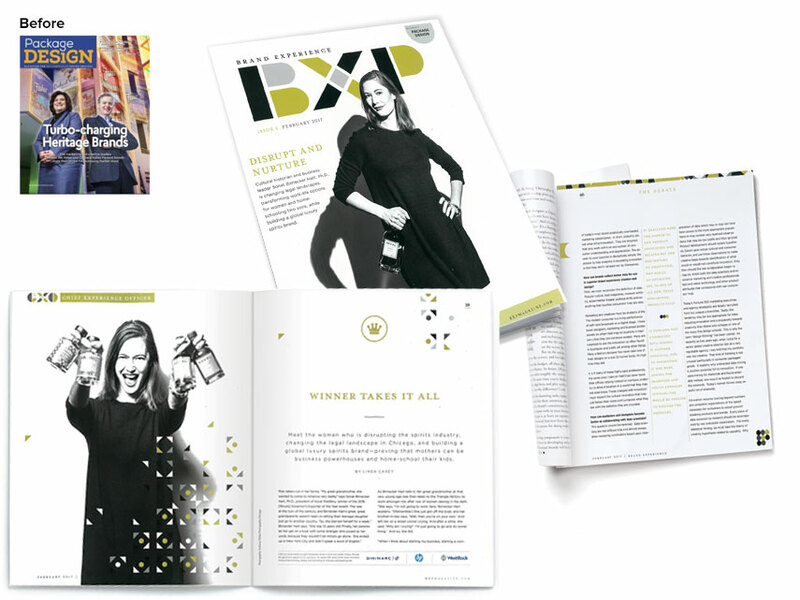 Above: Through touchpoints like digital, tablet and mobile, BXP is echoing its own editorial focus and delivering a holistic brand experience. The brand’s broadened focus comes through in content as well: coverage spans topics like research and trends, strategy and agencies to watch. A new platform, Innovation TV, takes readers to the front lines of future-focused design, and the new CXO Series goes one-on-one with chief experience officers from top brands. “I feel that together, our teams have produced an exceptional publication that features a sophisticated color palette and visual identity that truly complements our new strategic direction for the brand,” says Brownstein. 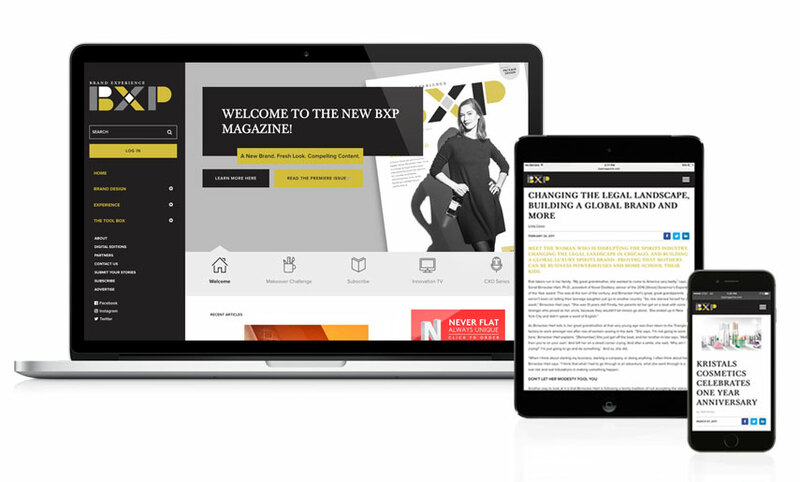 “We could not have made this transition without our amazing partners at LPK and Nielsen.” Already, the brand is seeing the transition pay off: BXP is garnering new subscriber audiences in a broader range of categories—from advertising and shopper marketing agencies to retail merchandising and promotional firms. Want to experience the new BXP? Head to their site, bxpmagazine.com.